Mumbai, Sep 14: BJP president Amit Shah Friday offered prayers to Lord Ganesh at various places in Mumbai as part of the ongoing 10-day Ganesh festival. Shah and his wife arrived in the city post-noon and were received at the airport by the party's city unit chief Ashish Shelar. The BJP chief visited a Ganpati Mandal in Bandra, headed by Shelar, to have 'darshan' of Lord Ganesh. The mandal's decoration theme this year is based on the Mhalsa Devi temple in Goa. A visit to the residence of ally Shiv Sena's chief Uddhav Thackeray, who also resides in Bandra, was not part of the BJP president's schedule, party sources said. 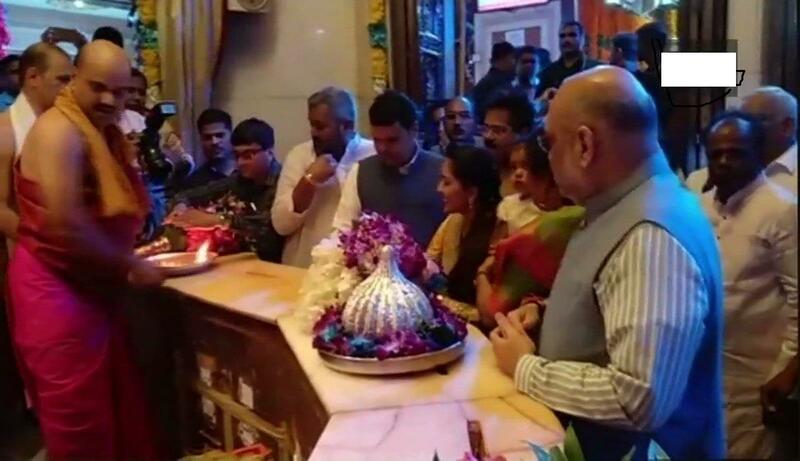 Shah then visited Shri Siddhivinayak temple in Prabhadevi and the Lalbaghcha Raja Ganesh mandal. 'Lalbaugcha Raja' is among the most famous public Ganpati idols in Mumbai. Maharashtra Chief Minister Devendra Fadnavis accompanied Shah during the Ganesh mandal and temple visits.